Around the Corners: A Wall or a Door? Everything is going great and all of a sudden, out of nowhere you hit a wall. I can't convey how often this happens in church life, or even life in general. But one thing that I have learned is that all walls have doors. 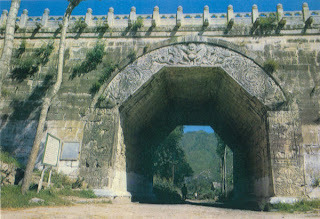 Even the Great Wall of China has gates as the cloud terrace gate pictured here. The goal of every wall encounter is to find the door. Some doors will be open and others closed. I personally recommend trying the open ones first, but then again, what is a door, but simply a wall with a key shaped door. Don't let the walls stop you today. find your way to the door and keep on.